For the best deals on accommodation in Port Douglas see our huge selection of packages that will save you time and money. The fully self-contained 1 and 2 bedroom accommodation at the Mango Tree Holiday Apartments offers a great range of facilities in a convenient location. Self-drive guests will enjoy the undercover parking while the local bus stop at the front gate makes exploring Port Douglas a breeze. Offering deluxe beachfront accommodation, Beaches Port Douglas features 2 and 3 bedroom self-contained apartments with private balconies offering picturesque beach views. Just metres from the beach swimming enclosure, the resort also offers a great range of activities and facilities including swimming pool and barbecue area. Conveniently located just a short stroll from the marina, Four Mile Beach and the shopping, dining and entertainment of Macrossan Street, Cayman Villas offer self-contained villa accommodation with a touch of luxury. With 1, 2 and 3 bedrooms to choose from, the villas feature spacious living areas and balconies. Located within walking distance of 4 Mile Beach and the shopping, dining and entertainment of Port Douglas Village, Central Plaza Apartments Port Douglas features self-contained accommodation boasting private balconies, an outdoor pool and spa, scenic views and much more. Set in the heart of Port Douglas, Club Tropical Resort offers guests affordable accommodation in self contained studios and apartments that are surrounded by lush tropical gardens. The resort also features an outstanding range of facilities and a wide range of local activities and attractions in a convenient location. With Four Mile Beach right on your doorstep, Coconut Grove offers luxury 1, 2 and 3 bedroom apartments with full kitchen facilities, rainforest or ocean views and an excellent range of onsite facilities. The resort also offers easy access to a range of popular activities, tours and attractions. You'll want to hang around and soak up the atmosphere of these self-contained studios & 1 and 2 bedroom apartments located in the heart of Port Douglas. Just 200m from the beach and a short walk from the centre of town, Garrick House enjoys stylish accommodation in an excellent location. Hibiscus Resort & Spa is ideally located only 300 metres from Four Mile Beach and the Marina, and 100 metres from Port Douglas Village where you will find a vast array of restaurants, bars, cafes and boutique stores. This Port Douglas Resort offers Balinese inspired self contained studios, 1, 2 & 3 bedroom apartments and great onsite amenities including a day spa, 2 resort pools, a wading pool, 2 cold spas, BBQ facilities and guest laundry. Located in the heart of Port Douglas on Macrossan Street, Le Cher Du Monde offers self-catering apartment accommodation with an open air design and tropical décor. Home to an outstanding range of facilities, the resort is just minutes from the famous 4 Mile Beach. Le Cher Du Monde is an adult retreat, welcoming guests 15 years of age and over. Just a short stroll from the town centre, Lychee Tree Holiday Apartments offers Port Douglas accommodation within easy reach of shopping, dining and the beach. The 1 and 2 bedroom apartments are complete with fully self-catering facilities and a private patio or balcony. Offering absolute luxury on the waterfront, Mandalay Luxury Beachfront Apartments feature 2 and 3 bedroom accommodation with spacious, classic interiors of shell, stone, teak, celadon and aquamarine adding to the stylish tropical atmosphere of Port Douglas. 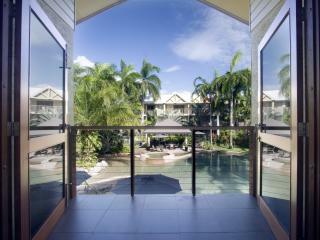 Sit back and relax in the unique tropical atmosphere of Port Douglas at Mantra Aqueous on Port. Offering guest room and apartment accommodation, each room enjoys its own private balcony and spa with some even boasting direct pool access. Centrally located in the heart of Port Douglas, Mantra Heritage offers self-contained accommodation with a great range of onsite facilities. The 1 and 2 bedroom suites feature kitchenettes and private balconies surrounded by the best attractions North Queensland has to offer. Located within walking distance of Port Douglas village, Mantra Portsea offers luxury 1 and 2 bedroom hotel rooms and apartments boasting easy access to a fantastic range of leisure facilities including a lagoon pool, poolside bar, day spa and beauty salon and all this on trendy Davidson Street. 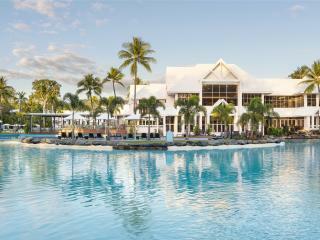 Soak up the cosmopolitan atmosphere of Port Douglas' galleries, boutiques and fine dining at Mantra in the Village. Offering hotel rooms and 1 and 2 bedroom self-contained suite accommodation, the resort enjoys an excellent range of facilities close to a range of local attractions. 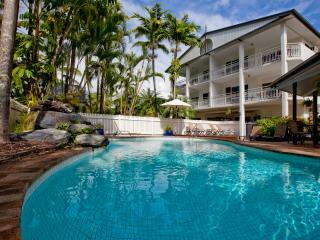 Located just a short stroll from Dickson's Inlet, Mantra on the Inlet offers traditional colonial-style hotel rooms and 1 and 2 bedroom spa suites ideally located on Macrossan Street close to the famous Port Douglas shopping and dining and home to a great range of onsite facilities. Located just metres from famous 4 Mile Beach, Meridian Port Douglas offers luxurious boutique studio and 1 bedroom apartments ideal for couples and honeymooners as the resort welcomes guests over the age of 16 years. Also within walking distance of the marina, this Port Douglas accommodation enjoys access to a great range of facilities including pool, spa and tour desk. Situated 100 metres from the spectacular Four Mile Beach, Mowbray by the Sea offers luxurious self-contained apartment accommodation with a private and peaceful ambiance. 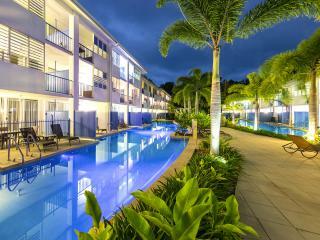 The resort is also within walking distance of the cafes, dining, bars and boutique shopping of Port Douglas village. Offering 1, 2 and 3 bedroom apartment accommodation surrounded by the best that Port Douglas has to offer, Nimrod Resort Apartments are just a short stroll from Four Mile Beach and only minutes from the marina, shopping and dining of Port Douglas' main township. Niramaya Villas and Spa will take your breath away with the natural tranquil surroundings and luxury Balinese Villa style accommodation. 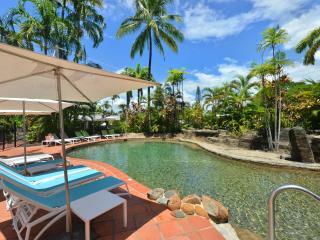 Set on fifteen hectares of lush gardens in tropical Port Douglas, where you are only a short stroll to Four Mile Beach. Leave feeling totally rejuvenated and wanting to come back for more. Offering stylish 4 and a half star accommodation, Oaks Lagoons is home to holiday apartments with the stunning Four Mile Beach a short five minute walk away. With easy access to local activities and attractions, the resort is also the ideal base for exploring the Great Barrier Reef and Daintree Rainforest. Nestled in the charming and relaxed seaside town of Port Douglas, Oaks Resort Port Douglas offers deluxe guest rooms and 1 and 2 bedroom villas with an outstanding range of onsite leisure facilities including a lagoon style swimming pool with swim up bar, restaurants, day spa and more. Just 10 minutes from the heart of Port Douglas, Paradise Links Resort Port Douglas offers comfortable hotel rooms, and self-contained apartments and villa accommodation within walking distance of Four Mile Beach. Surrounded by tropical gardens, the resort overlooks a golf course and offers fantastic facilities. 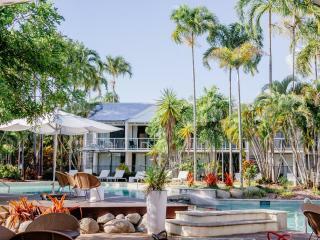 Located on the shores of stunning Four Mile Beach, Peninsula Boutique Hotel Port Douglas offers self-contained suite accommodation just minutes from local shopping dining and attractions. Offering the comforts of a large hotel with the intimacy of a small property, the resort enjoys a great range of facilities. 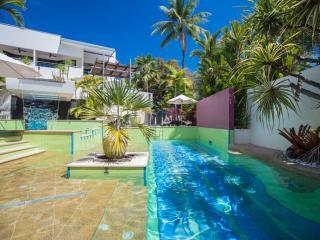 This adults only Port Douglas accommodation is perfect for your next Port Douglas getaway. Enjoying a spectacular location overlooking Four Mile Beach, Peppers Beach Club offers spa and 1, 2 and 3 bedroom suites with garden, lagoon or beach views and an excellent range of onsite facilities including an exclusive spa, lagoon pool and swim up pool decks close to a range of Port Douglas attractions. The Pink Flamingo offers a unique adults' only boutique resort just metres from 4 Mile Beach. 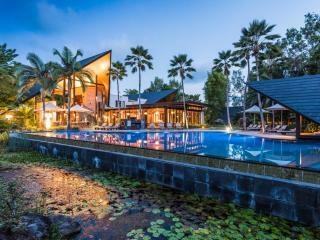 Surrounded by lush tropical gardens, the resort offers private accommodation studios and villas, just minutes from the cosmopolitan hub of Port Douglas. Offering modern self-catering 2 and 3 bedroom apartment accommodation, the Pool Port Douglas is just minutes from the shopping, dining, activities and attractions of the centre of town and is the ideal place to base yourself for exploring the Great Barrier Reef and Daintree rainforest. Just metres from Four Mile Beach, Port Douglas Apartments offer guests self-contained 1 bedroom apartments with some of the best facilities close to the wide range of local shopping, dining, activities and attractions that Port Douglas has to offer. This property welcomes guests aged 18 years and over, so it is a perfect couples retreat. Located within walking distance of 4 Mile Beach, the Marina and local boutique shopping and dining, Port Douglas Palm Villas offer stylish self-catering unit accommodation in the centre of Port Douglas village. The spacious indoor atrium welcomes you into a tropical scene of towering plants and a relaxing atmosphere. Located just a short stroll from Port Douglas village, Port Douglas Retreat offers stylish, spacious air conditioned studio-style units surrounded by the best local activities and attractions. The resort is also home to a heated pool, expansive sun deck, BBQ facilities and more. Just 400m from Four Mile Beach, Port Douglas Sands Resort offers spacious and well-appointed 1, 2 and 3 bedroom apartment accommodation. This family friendly resort is also home to spectacular tropical gardens, a swimming pool, spa, BBQ area and much more. Set on 10 acres along the Four Mile Beach beachfront, Pullman Port Douglas Sea Temple Resort & Spa offers stylish and spacious studio, 1, 2 and 3 bedroom apartment accommodation with an outstanding range of onsite leisure facilities including an 18-hole golf course. Offering numerous stylish rooms to choose from, Ramada Resort by Wyndham Port Douglas features spacious and well-appointed accommodation right on Four Mile Beach. Just minutes from town, the resort is home to a signature restaurant, day spa, beach club and a great range of facilities. 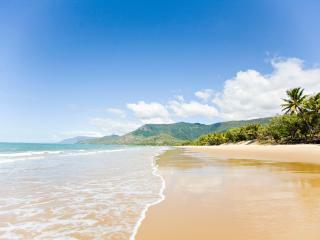 Ramada Resort by Wyndham Port Douglas is perfect for families and couples alike. Offering Mediterranean style apartment accommodation just minutes from the Macrossan Street village and 4 Mile Beach, Reef Club Resort Port Douglas boasts a fantastic range of amenities and facilities including private balconies, a swimming pool, timber sundeck and much more. Surrounded by lush tropical gardens just minutes from the Port Douglas village, Reef Resort Villas Port Douglas offers stylish self-contained 1, 2 and 3 bedroom 2 storey villa accommodation with private balconies or patios and a fantastic range of onsite facilities just a short stroll from 4 Mile Beach. 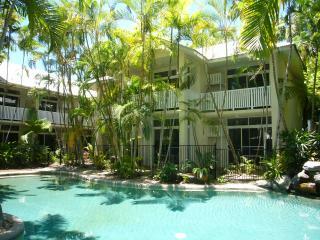 Exuding comfort and style, Regal Port Douglas offers a choice of studio and 1 and 2 bedroom self-contained apartment accommodation complete with private balconies and outdoor jacuzzis or indoor spa baths just a short stroll from 4 Mile Beach, The Reef Marina, Macrossan Street and more. Offering deluxe 2 and 3 bedroom holiday apartment accommodation, Saltwater Luxury Apartments feature fully conditioning, full kitchen facilities complete with prestige appliances. Located on the popular Macrossan Street, Saltwater Luxury Apartments is close to many Port Douglas attractions including Four Mile Beach, Reef Marina and plenty of shops and restaurants. Surrounded by the most popular local attractions, Seascape Holidays - Coral Apartments offer apartment accommodation boasting an excellent range of onsite facilities and all a short walk to Four Mile Beach and a few blocks from the cosmopolitan dining of Macrossan Street and the Reef Marina. Offering personal service in relaxed and tranquil atmosphere, Shantara Resort Port Douglas features boutique resort-style hotel room and self-contained apartment accommodation just a short stroll from Four Mile Beach and the cosmopolitan strip of Macrossan Street home to a great range of facilities. Located right on Four Mile Beach, Sheraton Grand Mirage Resort Port Douglas is a resort of international standard and offers well-appointed hotel rooms, suites and private villa accommodation. The resort facilities are second to none including a number of bars and restaurants, an 18-hole championship golf course, multiple lagoon swimming pools and much more. Nestled on a rugged outcrop surrounded by lush rainforest, woodlands and mountains that meet the sea, Thala Beach Nature Reserve offers luxury bungalow and suite accommodation with treetop or Coral Sea views just 10 minutes from Port Douglas. A truly unforgettable holiday experience, The Pavilions is located in the heart of Port Douglas just a few minutes from Four Mile Beach and a range of shopping and dining options. Offering studio and 1 bedroom apartment accommodation, the resort is home to everything you need.